Full Power graffiti remover for porous surfaces which removes spray paint on the first pass, removing the need for harsh anti-ghosting products. Full Power breaks the graffiti up without dissolving it. This prevents the graffiti from soaking into the wall. The broken up flakes of paint are then easily removed with a pressure washer without leaving any ghosting. State of the art formulation removes leather dyes, inks, stains and waxes, the new graffiti markers of choice. Full Power is not suitable for use on solvent sensitive surfaces such as plastics & polycarbonates. 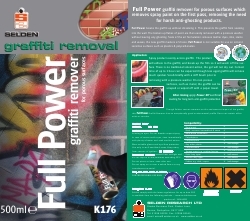 Though Selden cannot comment on the environment impact of the graffiti, this Full Power Graffiti Remover has an exceptionally good environmental profile. Does not contain either acids or caustics. Spray product evenly across graffiti. The product will adhere to the graffiti, and break up the film so it will wash off the surface. There is no traditional solvent action, the gel will not dry out. Contact time of up to 1 hour can be expected though less aged graffiti will remove much quicker. Scrub briefly with a stiff brush prior to removing with a pressure washer. On non-porous surfaces, such as metal, the graffiti can be scraped or wiped off with a paper towel. After rinsing apply Power Off sacrificial coating for long term anti-graffiti protection.